When returning from a haircut appointment recently, I swung by the former Cathedral City home of the visionary painter Agnes Pelton. She moved out of the house in 1960 and died a year later; today hardly anyone remembers she once lived there. [Editor’s note: This has changed since 2010 when this was written.] Still, I go by now and then just to check on the place. Agnes Pelton date painting from the collection of Robert and Kay Hillery. Photos by Christy Porter. I drove down a narrow lane, braking to avoid semi-stray dogs and abandoned cars, and parked in front of a duplex—an ungainly hybrid of Spanish style and modern additions. Folded laundry heaped on a vehicle out front suggested someone was moving out, and a “For Sale” sign confirmed the impression. In the times I’d driven by the house, I’d never gotten closer than the street. This was a clear invitation for me to peek inside the one-time lair of a true desert mystic. Until recently Agnes Pelton’s fan club has been small but fervent. The artist painted the usual desert smoketrees and dunes, but she’s better known for her cosmic abstractions that plumb the unseen forces behind the landscape. People like me who know nothing about abstract art can still take pleasure in her orbs and wings and plumes of light. She expressed transcendence so well that anyone could get it. 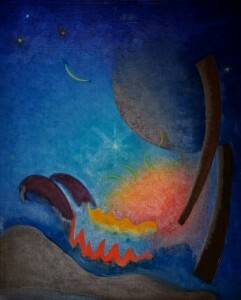 Night Fires by Agnes Pelton, from the Hillery Collection. Because of the cosmic reach of her landscapes, Pelton has often been compared to Georgia O’Keeffe. In fact the painters’ careers ran on parallel tracks. Both studied with Arthur Wesley Dow in New York; both came to the desert at the invitation of Mabel Dodge Luhan. (Tony and Mabel Dodge Luhan once visited Pelton in Cathedral City). Both found their true love in the Southwestern landscape. O’Keeffe is by far the more famous painter, but Pelton’s status took a big leap in the summer of 2009 with a show called “Illumination” at the Orange County Museum of Art. Curator Karen Moss had the gumption to hang Pelton’s works side-by-side with Georgia O’Keeffe’s. The buzz among visitors: Pelton outshone the New Mexico maestro. Much as I’d like to continue the O’Keeffe parallel—I have to say the duplex at 68-680 “F” Street hardly resembled the majestic Ghost Ranch. Though Cat City (as they call it locally) was rural when Pelton moved there, the lower cove neighborhood has taken on a gritty cast in recent years. As I got out of the car and crossed the gravel front yard for the first time, I felt I was getting closer to Pelton the person. Pushing through an unlocked gate, I could see this side of the duplex was vacant. It was safe to look around. I continued past the newer section of the house, through a second gate, past a dripping air-conditioner unit, till I came to the original core of the house: The studio Pelton completed in 1939. The curtains in the main room were open a notch. It was a solemn moment, for as I looked inside I saw Pelton’s studio looking as if she’d walked away yesterday. There was the fireplace with—for all I knew–her own fireplace tools, the original diamond cut concrete floor, and the spot where her easel stood and where—for 20 years—she did some of her most enduring work. The scene matched exactly a photograph of Pelton’s studio in Michael Zakian’s book: “Agnes Pelton: Poet of Nature”. Wanting to know more about this early Cathedral City resident, I went to visit the first elected mayor of Cathedral City, Robert Hillery. Hillery and his parents were close friends and neighbors of Pelton’s when Bob was just a boy. Hillery’s dad sold Pelton the lot where she built her house. When you enter Bob and Kay Hillery’s Indian Wells home, you look right and there in the dining room is the “Pelton wall”, a trio of Pelton paintings including a radiant cluster of dates. Bob Hillery walked me into a back room, struggling over the steps due to a painful back surgery, and showed me a portrait Pelton had painted of his mother, Marguerite. 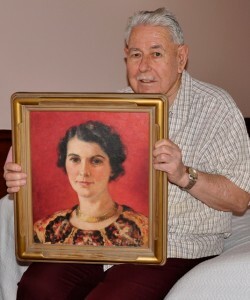 Robert Hillery with Pelton’s painting of his mother, Marguerite. Pelton was so otherworldy in her interests that I expected in person she would have worn turbans and levitated off the floor. Surely she’d be inaccessible to ordinary people. But in talking to Hillery, a different picture emerged. The Pelton he knew was an involved member of the small Cathedral City community, then numbering only 100 or so residents. Cat City in those days was a place where teachers dispatched rattlesnakes in the schoolroom, and wild horses came down from the hills and turned on the water taps. Hillery told me Pelton never learned to drive so she relied on rides from the neighbors. It took a minute to absorb this—a landscape painter with no wheels. 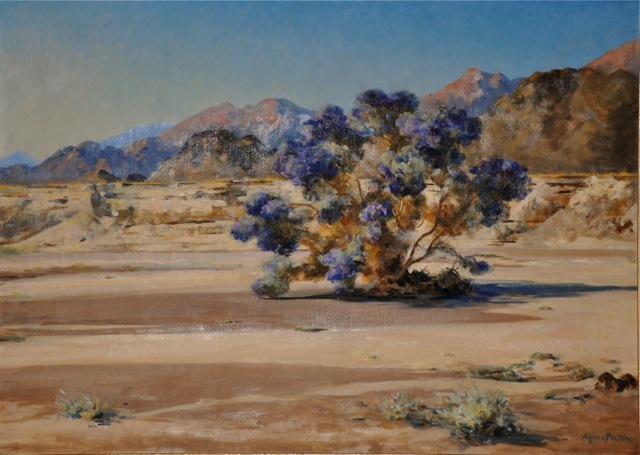 Hillery’s father, Willard, would drop Pelton and her paints off beyond the second wash out on Date Palm and come back several hours later to retrieve her. 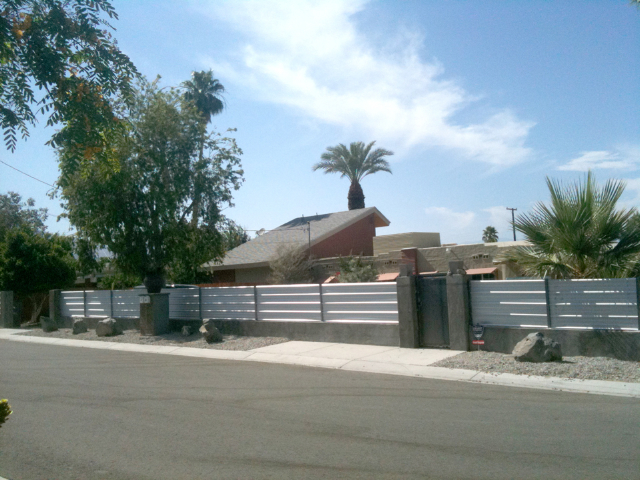 Agnes’ next door neighbor was Harriet Day, director of the influential Desert Inn art gallery. 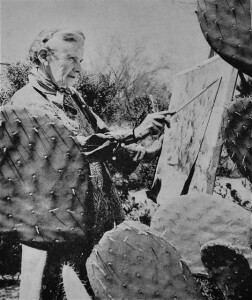 Her visitors included artists like Cabot Yerxa–the pueblo-builder of Desert Hot Springs–and Jimmy Swinnerton. Pelton was also friends with Claude and Edna Cobb, owners of the first store in town (it doubled as a post office and gas station). Claude Cobb owned a date ranch off of DaVall Road and it was there that Pelton painted her famous date portraits. Like the very best mystics, Pelton was firmly grounded in the everyday world of her neighbors. She’d talk to young Bob Hillery about the adventures of his Boy Scout troop, and was always eager to know where he’d gone in the mountains. Pelton eventually bought a cabin from the Cobbs on Thomas Mountain (up the winding Highway 74 from the Coachella Valley). Just up the hill was the Hillery cabin. Again, she relied on the kindness of neighbors to drive her back and forth from the valley to the mountains. When Pelton died at age 79 she was still exploring the depths of light and life in her final painting “Light Center”. Her ashes were placed on San Jacinto Mountain. Agnes Pelton at work, from the Palm Springs Villager. And what became of the house with the For Sale sign? I alerted some Pelton fans, hoping the City or a benefactor would buy it and start a Pelton museum–but that didn’t happen. The realtor never knew it was Pelton’s house, and neither did the man who bought it, Peter Palladino. The Los Angeles photographer was surprised when he found his desert getaway had belonged to a fabled artist. Let’s hope he keeps her studio just like he found it. On the way home from my next haircut, I’ll be driving by to take a look. To learn more: California State University Long Beach associate professor Nancy Strow Sheley will discuss the landscapes of Agnes Pelton on April 25, 2011, at 2 pm at Kevin Stewart Fine Art in Palm Springs, 2481 N. Palm Canyon Dr. (760) 327-7000. The event is free; seating is limited. The Hillery home will be included on the “Desert Art Home Tour” of the Historical Society of Palm Desert: April 24, 2011, 9 a.m.—4 p.m., 72-861 El Paseo, Palm Desert. (760) 346-6588. $125 for Historical Society Members and $150 for non-members. Pelton’s light shines bright in the desert sky still — a’twinkle atop San Jacinto. Thank you for this beautiful piece on an inspiring woman. Thank you Ann. You took me on a wonderful journey with this piece. Dear Ann,Wow you have been working! Beautiful web-site and writing.I can’t wait to hop in my car and go to the second wash on Date Palm. My house is probably sitting on the remains of the date farm. I was so surprised to read your wonderful article today. We own a painting by Agnes of a small cabin in the woods. The cabin is painted a creamy yellow with a screen door and small window trimmed in October yellow. The inside door is slightly open, giving you a hint of what is inside. The pines around the house include rich blue and purple tones. On the front left hand lower corner it states “To C + E. Cobb”. 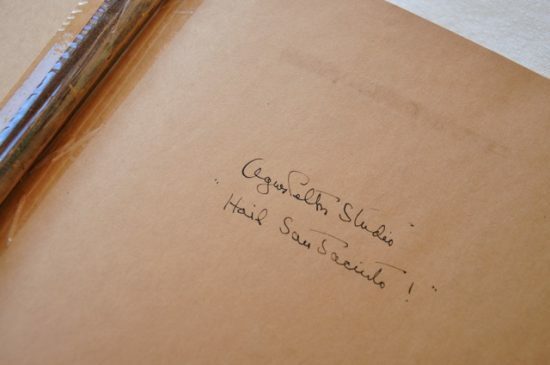 It is signed by Agnes Pelton and dated ’42. Your article has answered many questions that we never thought could be answered. I can now guess that she painted it for her friends Claude and Edna Cobb, a portrait of a humble place they all loved. Your documentation of a glimmer of time has given this painting for me a new connection to Agnes, of her life and joys. I can imagine her waving with her bag of paints in one hand as her friend Hillery’s dad drives away. I found additional information about the cabin on page 94 and 122 in “Agnes Pelton: Poet of Nature”. I can only imagine the skies and flora she studied around her cabin that are still reflected in her work today. A cool place to stay in the summer to hike, read, reflect and paint. I hope one day that we can drive up Thomas Mountain and find that cabin and like you get a rush of Agnes Pelton energy. Just drove by and will experience the interior this coming week. I’m honored this article was sent to me. Just discovered your article as I was browsing for anything that might be new about Agnes. My fraternal grandmother, Dorothy Tilton Gillespie, was Agnes’ first cousin. I visited Cat City before I moved away from S. California to live nearer family in Florida. I wanted to see where Agnes lived and was never sure if I found THE house. Did you take pictures when you were there? I would love to see them if you did. Thanks for printing up and sharing this lovely article. I enjoyed reading it and will share it with family. The owner of Pelton’s former home, Peter Palladino, sent a photo of the exterior. I added it at the end of the article. If you’re looking for the house, remember that the back–in Pelton’s day–is now the front. Peter, Simeon and Nancy: Thank you for such an inspiring afternoon on January 22, 2011. Your labors of love are greatly appreciated. Now that I can put a face and a hand-shake to each of you. I am again inspired to continue my work about my cousin, Agnes Pelton. Just stumbled onto this wonderful article! I live on what I believe is 1/2 of the farm Agnes Pelton used to own in Connecticut. She sold half of it to someone named Tilton whom I believe was a relative in the early 1900s but retained the half I live on into the 1930’s or 40’s. I have found nothing on the internet that mentions she lived in CT but I feel certain this is the same Agnes Pelton mentioned in the old deeds. “The farm (which she spent a lot of time on, mostly in summers) belonged to her aunt, Alice Tilton Gardin, who was Florence’s younger by three years sister. She was also an artist and quite well known locally for, I believe, her flower paintings and landscapes. Her daughter was Laura Gardin Fraser, a sculptor, who was married to James Fraser, a more famous sculptor (and part of the group that put on the Armory Show). They did things like bas-reliefs (his best known was called ‘The End of the Trail’) and were quite successful. They each had studios at the farm, so I would have expected them to inherit it. 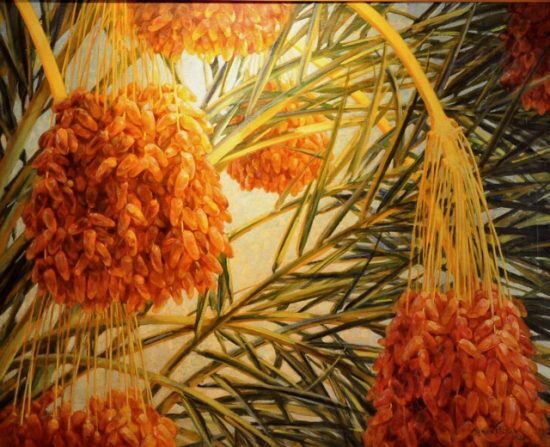 We are family of Agnes Pelton. We have many cards and letters she sent from Cathedral City long ago. We have other items including cards and letters sent by Eve Gardin Shroyer her cousin when she was there taking care of Agnes”Aggie” in the last months of her life. Eve was the daughter of Alice Tilton Gardin. Agnes was the daughter of Alice’s sister Florence Tilton Pelton. Aggie was in close contact with the family all her life. We hope to attend a future event honoring her and her work. I am writing a research book about American Artists, including Agnes Pelton, and I need to get the details of her copyrights holders. Can you please help me with the matter? Is it possible to contact me by mail with mr. Charles Pelton? Does anyone know the location of Agnes Pelton’s “Being”? Last I heard, it was hanging in the lobby of Southwestern Bell in San Antonio, but that may not be reliable. Now rebranded as SBC, they seem to have decamped San Antonio.